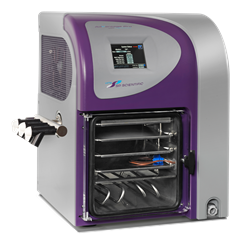 The VirTis AdVantage Pro with Intellitronics™ freeze dryer offers the convenience of a tray dryer in a benchtop unit. This development scale lyophilizer is ideal for laboratory research, as well as small production with up to three shelves capacity. It is an economical bench top freeze dryer that has many world class features: precise shelf temperature control, sophisticated full color touch screen display, automated cycle controls, thermal treatment steps which can accommodate annealing steps, automated backfill step, stoppering option and quick seal valves for manifold drying. The AdVantage Pro comes in a clean room version for a small scale production environment. Besides it handles 96 well plates, serum bottles, vials, etc. The condenser has a six-litre capacity and is available in -70˚C and -85˚C condenser temperature options. It can also be configured to display vacuum in mTorr, Pa or mBar. The industrial-grade programmable logic controller (PLC), the Intellitronics™ controller provides extreme versatility while remaining intuitively easy to use. The controller allows for custom programming of recipes, offers flexibility through recipe customization with 10 thermal treatment and 12 drying steps. The system can store up to 16 recipes which can be managed through the Recipe Manager function. The system is installed with 4 product probes which can display individual probes or the average of active selected probes. Manual function options such as vacuum control and shelf temperature control are also available. The touch-screen navigation enables easy monitoring of system status that displays the system’s phases, status and time, along with current key cycle parameters and set points. The Controller offers many additional features for superior freeze-drying cycles: Integrated performance and leak tests, Ethernet communications, alarm alerts through email, remote access via remote operator and SD card suite software, shelf-driven mode or product-driven mode, optional components such as backfill, stoppering, manual or automatic control, etc.